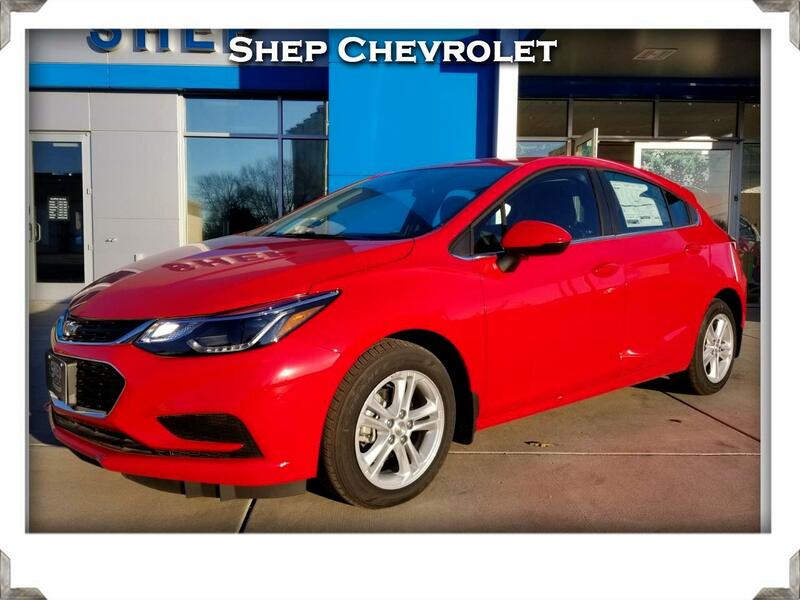 Shep Chevrolet is proud to offer this new 2018 Chevrolet Cruze Hatchback LT. If you're looking for a stylish, fun-inspired, well equipped & fuel efficient hatchback to drive with pride, then schedule to test drive this Cruze LT hatchback today. Do you have questions about pricing, options, incentives or availability of similar models? Give us a call at 800-468-3650 and we'll help answer all of your questions. Warranty Description: Shep February Special! ~~> BUMPER TO BUMPER: 6 YEARS / 120,000 MILES. For 6 years or 120,000 miles, whichever comes first. Any vehicle "defect" repairs are covered. POWERTRAIN: 6 YEARS / 120,000 MILES The powertrain, which consists of your engine, drive systems, transmission/trans-axle, transfer case and emission control systems is covered for 6 years or 120,000 miles, whichever comes first. ROADSIDE ASSISTANCE: 6 YEARS / 120,000 MILES. MAINTENANCE BENEFITS: For New 2018 Vehicles: 2 YEARS / 24,000 MILES - 2 VISITS Includes two oil changes, oil filter changes & tire rotations according to your vehicle's maintenance schedule. Full warranty repair and coverage guidelines are governed by Ally Premier Protection standards. This is a limited time offer than can end at any time. See Shep Chevrolet for plan specifics. *MSRP less cash offers. Tax, title, license and dealer fees extra. Residency restrictions apply. Not available with some other offers. See dealer for details. 1 Excludes L model. Not available with special financing, lease and some other offers. See participating dealer for details. Must take retail delivery by 04/30/2019 2 Excludes L model. Some customers may not qualify. Not available with special financing, lease and some other offers. See dealer for details. Must take retail delivery by 04/30/2019 **Lowest pricing of vehicles on this web site may not include options that have been installed at the Dealership. Pricing may include current promotions, incentives, and/or bonus cash. Incentives are subject to eligibility and compatibility guidelines provided by the manufacturer. All rebates to dealer. Published price subject to change without notice to correct errors or omissions or in the event of inventory fluctuations. Monthly payment calculator is an estimate and does not include tax, title, license or doc fees. Please contact the Dealership for latest pricing and monthly payment. Please contact store by email or phone for details. While every effort has been made to ensure display of accurate data, the vehicle listings within this web site may not reflect all accurate vehicle items. Accessories and color may vary. All Inventory listed is subject to prior sale. The vehicle photo displayed may be an example only. Vehicle Photos may not match exact vehicle. Please confirm vehicle price with Dealership. See Dealership for details.